The OSADL Networking Day 2018 will take place on Wednesday, June 20, 2018 in Heidelberg/Germany, and we hereby would like to cordially invite all OSADL regular, associate and academic members to participate at this event. The main topic of this year's Networking Day will be "Next-generation Open Source industrial real-time communication" that particularly focusses on the Publish/Subscribe extensions of the OPC UA protocol and the possible connection with Time-Sensitive Networking (TSN). However, as always, other topics of current interest will also be covered. The traditional mix between presentations on current topics of interest and the networking as well as the mutual exchange of ideas among OSADL members has motivated many of you to take part in recent years' OSADL Networking Days. We hope that this will be the case this year as well and are looking forward to welcome many of you on June 20, 2018 in Heidelberg. Please use this registration form for registration. Do you also want to actively contribute with a presentation? If so, we certainly would gratefully acknowledge any such active contribution; in this case please refer to the call for papers and instructions below. Although the "new" approach to industrial networking based on the OPC UA protocol was presented already in 2016, it was only in autumn 2017 at the occasion of the SPS IPC Drives that the so-called Shaper Group, an industrial consortium of major players in the field of industrial networking, moved the topic forward ( article in German) and presented ( article in German) a much-noticed paper. It was the same occasion of the SPS IPC Drives exhibition that OSADL received a large number of requests to take care of this topic. This interest resulted primarily from the fact that the pure OPC UA technology did not fulfill industrial requirements and the much needed Publish/Subscribe (Pub/Sub) extensions were not available under a usable Open Source implementation at this time. The Pub/Sub extensions are so much needed because the low-power devices that are expected throughout the future Internet of Things do not provide the resources for traditional connection based communication and require the multicast technology of Pub/Sub. Fraunhofer IOSB in Karlsruhe, Germany, the India based system integrator Kalycito Infotech and OSADL launched a community project that was partially funded by OSADL member companies to remove the above named limitations and to develop an IEC62541-compliant software package with Pub/Sub-extension under the Mozilla 2.0 Open Source license. This has generated a lot of interest that led to the preparation of a follow-up project. All of this finally created the basis to make OPC UA/TSN this year's main Networking Day topic. At the OSADL Networking Day we want to explore the mentioned issues. We are glad that Fraunhofer and Kalycito already gave us a positive response when we ask them whether they would be available to actively participate at the event. But we are also looking for speakers of the OSADL community who want to share their experiences with us. If you are willing to contribute, we need the title, a short abstract (max 1,200 characters) and a short biography (max 300 characters). In addition to the planned 30-minutes talks on the mentioned main topic, we have blocked a smaller part of the agenda of the OSADL Networking Day for short presentations on innovative products, developments and services of our members, which may be of interest for the participants. We need a descriptive title. As there is only a limited time frame available for these short presentations, short presentations were considered on a first-come, first-served basis. The deadline for presentation submissions was May 14, 2018. The conference language of the OSADL Networking Day is English. All presentation material shall be in English too. Subsequent to the conference session you are cordially invited to join us for a tour on the Neckar River with the solar-powered boat "Neckarsonne". After the boat tour, we will have dinner together in a restaurant located in the pedestrian area of the old town of Heidelberg. For registration as participant please use the registration form available here: Registration. Please register before June 4, 2018. If you plan to give a presentation, for planning purposes we would very much appreciate, if you could let us have your presentation suggestions and short abstracts before May 14, 2018. TSN and OPC UA under Linux - how are they connected? The OSADL Linux addon patch: Why is it separate and what does it contain? How to prepare for OSADL License Compliance Audit (LCA) using prior in-house Linux delta scanning? Boat trip on Neckar River with solar-powered boat "Neckarsonne"
The conference language is English, all presentation material will be in English. Please note that the OSADL Networking Day 2018 is an internal OSADL event; thus, unrestricted participation is only available for OSADL regular members, OSADL associate members and OSADL academic members. However, a limited number of places have been reserved for non-members who are interested in OSADL's work and would like to learn more about OSADL. These places for non-members will be allocated on a first-come, first-served basis. The conference language of the 2018 OSADL Networking Day is English. All presentation material will be in English, too. Hotel Ibis Heidelberg, Willy Brandt Platz 3, D-69115 Heidelberg, phone +49 6221/9130, www.ibis.com; email: H1447-REªaccor.com Price per person/night: 86 EUR including breakfast. The room contingent is blocked for the nights of June 19 to June 20 and June 20 to June 21, 2018. The room contingent expires on May 1, 2018 (extended to May 28, 2018). HIP-Hotel Heidelberg, Hauptstraße 115, D-69117 Heidelberg, phone +49 6221/20879, www.hip-hotel.de; email: infoªhip-hotel.de. Price per person/night: 120 EUR including breakfast. The room contingent is blocked for the nights of June 19 to June 20 and June 20 to June 21, 2018. The room contingent expires on May 1, 2018 (extended to May 14, 2018). Parking opportunity at parking garage P11, Sandgasse, 69117 Heidelberg. Please contact the hotels directly, if you wish to book a room at the indicated price from these contingents. The rooms will be made available on a first-come, first-served basis. Please note that the room contingents expire as indicated. OSADL member login is required to display the booking code to mention when booking a room out of a contingent. 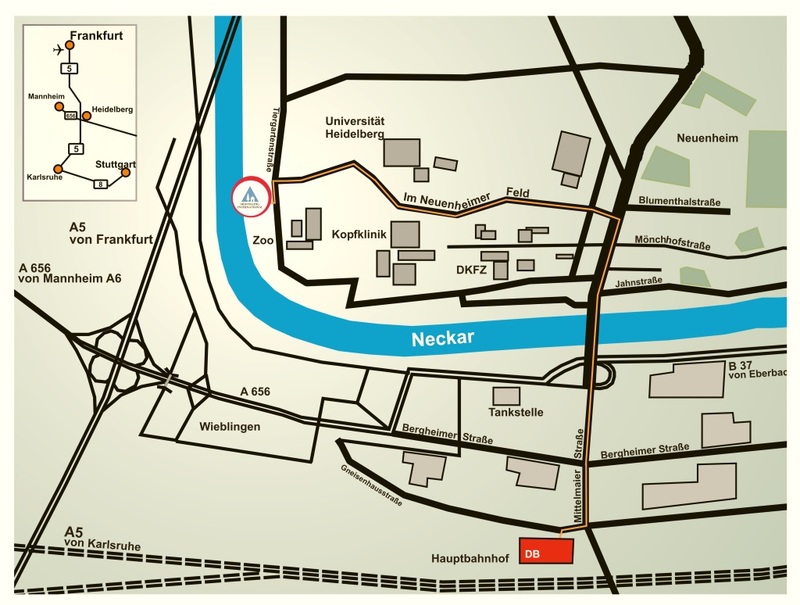 Subsequent to the conference session you are cordially invited to join us for a boat trip on the Neckar River with the solar-powered boat "Neckarsonne". While the ship gently glides by, you'll experience the most delightful views of the city. Departure of the boat is at 18:30 at the boat landing pier at the Karl Theodor Bridge, commonly known as the Old Bridge (Alte Brücke) on the old-town side of the river. For those who don't travel by car, a bus shuttle will be made available at 17:45 from the Conference Center of DJH Hostel Heidelberg International to the boat landing pier at Alte Brücke. The duration of the boat trip is approx. 60 minutes. After the boat trip, we will have dinner together at 20:00 in the restaurant "Palmbräugasse", located in the heart of the old town of Heidelberg. The restaurant is in a walking distance from the boat landing pier. Nearest parking possibility: Parking garage P8 "Kongresshaus", Untere Neckarstraße 44, 69118 Heidelberg. Route planner: Please click here for directions. Coming from expressway A5 or A6, at "Kreuz Heidelberg" please follow expressway A656 direction Heidelberg. At the end of expressway A656 turn left direction "Neuenheimer Feld" and follow the signs "Jugendherberge / Zoo". Parking spaces are available in the parking garage of Heidelberg Zoo, Tiergartenstraße 3, 69120 Heidelberg. The day pass costs 7 EUR. From the parking garage it's a 3-minute walk to the DJH Conference Center. An overview of all other parking possibilities in the Neuenheimer Feld area can be found here. By train: Please exit at Heidelberg main station. From there, take bus line 32 direction Uni-Klinikum/Neuenheimer Feld. Please exit at station "Jugendherberge". The ride takes approx. 10 minutes. By bus: From Heidelberg Bismarckplatz or Universitätsplatz (old town), please take bus line 31 or 32, direction "Neuenheimer Feld" and exit at station "Jugendherberge" or "Zoo".